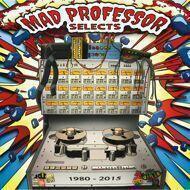 This special record sees Mad Professor delving into his archives and pulling out 9 previously unheard and unreleased tracks spanning the period from 1980-2015. Beginning with a track recorded in his front room studio at Bruce Road, and finishing with an unused from the Black Ark sessions from the 2015 tribute to Lee Scratch Perry, the album is a journey in the sound of Dub. A few of the tracks feature legendary rhythm section, Sly and Robbie.